PROF. ROBERT W. WOOD, of the Johns Hopkins University, has perfected an invention — based on a discovery — that may revolutionize the present costly and cumbersome methods of studying the stars and exploring the universe for new planets, suns, moons, and asteroids. Judging by the success the young scientist has had, the simplicity of the principle of his invention, and the comparatively small cost of models, the possibilities of his telescope are commensurate with the scientific-literary visions of Mr. H. G. Wells, fictionist extraordinary. Since the invention of the telescope, in the sixteenth century, it has been the dream of a great part of the scientific world actually to get a glimpse of the life that possibly exists on Mars and other planets; to secure some tangible proof of intelligent existence on the worlds around us. The probable results of such a discovery fire the imagination. The discoverer would be given a place far above Newton, Huxley, Darwin and all the rest who have helped to clear away the mind-fog of centuries by lighting the tapers of science. Our views of many things would be broader. Who knows ?—if we were able to communicate with these “people” of other worlds, might not much of our foggy philosophy and some of our old-fashioned beliefs go tumbling into the dust, never, unlike long-lived Truth, to “rise again” ? The reason astronomers speak so lightly on the inhabited planet question is because they know that no telescope is powerful enough to draw any star close enough to observe on it anything smaller than a lake or a mountain range. Telescope building is a herculean task, fraught with almost innumerable difficulties great and small, and it seems that the Lick and Yerkes telescopes — the former with 36-inch lenses and . the latter with 40-inch lenses—mark the comparative limit in size and power, for the present, at least. When it is “remembered that it took the finest glass makers in Paris four years to make two lenses for the Lick telescope, one gets some idea of what building a great telescope means. But in Professor Wood’s telescope there is no glass! Its reflecting surface- its lens—is mercury, revolving mercury, that magnifies and magnifies as the speed • increases until it brings the heavens down startlingly close. 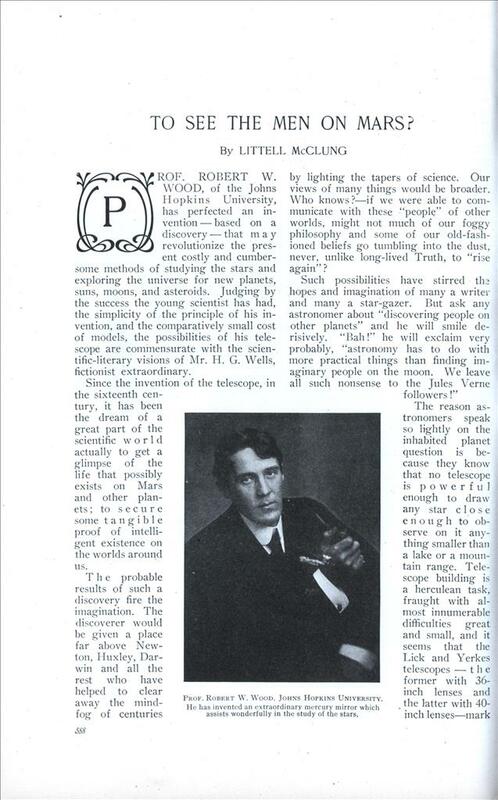 While Professor Wood, like most scientists, is somewhat reticent about his invention, it is not hard to conclude from his remarks that he has great hope of its accomplishing astronomical wonders. He says that the principle of getting reflections from the surface of a liquid revolving with uniform velocity is not a new discovery. Scientists have spoken of mercury telescopes for many years, but for some reason none of them, so far as I know, has ever tried to put the principle into practical operation. Many astronomers considered the thing humor- ously, for they knew how the slightest vibration causes ripples on the surface of mercury, distorting the magnified object. But this difficulty Professor Wood has overcome by an ingenious arrangement of magnets and supporting blocks. When the inventor took me into his laboratory in Baltimore and showed me a model of his telescope I was disappointed at the ordinary appearance of the apparatus. On an iron base rested a metal dish that turned on bearings. Around the edge of the dish were fastened little magnets. Encircling the dish about an inch from its edge was a metal ring the base of which was constructed independent of the base of the dish. With absolutely no connection between the two, vibration of the outer ring could not affect the dish. To the metal ring were attached other little magnets, the whole being turned by pulleys from a motor. Thus, when the ring was turned, its magnets, attracting the magnets on the edge of the dish, drew the dish around, easily and rapidly and without any perceptible vibration. Professor Wood picked up a pitcher of mercury and poured the liquid metal into the dish. He gave the motor a twist, and lo!—there was the telescope!—a wonderful instrument without doubt. The dish revolved rapidly, and in a few seconds the mercury surface became concave. This concave surface was a perfect paraboloid—the secret of its great magnifying power. As you looked into the glittering surface your face became larger and larger, and then as the dish revolved more rapidly, each feature assumed enormous proportions. The effect was more than surprising; it was startling. You began to wonder if you couldn’t bring Mars down to within a few miles if you had a revolving dish ten feet in diameter, a few buckets of mercury, and a Professor Wood to manipulate the apparatus. This apparatus appeared so simple that you wondered why somebody hadn’t tried it before. But then Professor Wood told me of the difficulties of overcoming vibrations from several sources, for any vibration affecting the mercury surface spoils the reflection. A footfall in the street fifty feet distant would send waves over the surface, hopelessly clouding the mirror, and so make a clear inspection of the heavens impossible. What has the inventor clone to overcome these vibrations? Surely he can’t eliminate them in the laboratory model just described? The answer is, that the inventor has not confined himself to laboratory work, but has constructed down in the earth a mercury telescope twenty inches in diameter. Last summer he went to East Hampton, Long Island, where he could work without interruption, choosing a farm for the scene of his experiments. He gathered up the odds and ends from his laboratory, made a mercury dish and set up a motor. This somewhat crude telescope worked beautifully with the exception of jars from four sources—(1) the driving mechanism, (2) the grinding of the bearing surfaces in the mercury basin itself, (3) the imperfect leveling of the instrument, and (4) variations in the velocity of rotation. Then, realizing that it was possible to eliminate all these disturbing influences in a larger and more costly instrument, Professor Wood set to work to build the perfect mercury telescope. A well-house adjoining a barn was made into what the professor dignified by the term “observatory.” The well itself was filled with granite blocks and cement up to two feet above the water level. Then it was lined with cement, forming a water-tight pit fourteen feet deep. The bottom, or base, of course, was absolutely solid—the thing most desired. Several feet from this pit —six, to be exact—another pit was dug and the two were connected by a little tunnel. In this second pit the motor and speed pulleys were set up and driven by a 110-volt alternating current. The belt, of course, passed through the tunnel, as shown in the drawing. The tunnel was lighted by an electric globe. In the first pit three blocks of cast iron were placed on the thick granite and cement base. On these the dish for the mercury was set. Directly over the dish Professor Wood cut a hole in the roof of the well-house through which he could look down about twenty feet and see the heavens at remarkably close range. Now and then he still smiles over the fact that in most telescopes you have to look up to see the skies above, while in his you look directly away from the star under observation. This telescope was an astonishing success, save for slight vibrations. Professor Wood discovered that anyone walking on the grass anywhere in the vicinity affected in some degree the whirling mercury surface. But by keeping the dish perfectly balanced, the apparatus free from jars and friction, and the immediate neighborhood quiet, the inventor was able to get distinct impressions, as through the most powerful glass tele- scopes, of those stars directly overhead. The coming of cold weather and the necessity of Professor Wood’s return to the lecture rooms of the Johns Hopkins University put an end temporarily to these important experiments. This spring Professor Wood will go back to East Hampton and continue his experiments, perhaps inviting several noted scientists to view the wonders shown by his paraboloid mercury basin. It is true that such a gigantic mercury lens would require a deep foundation and the most careful adjustment, but these are only mechanical problems that could be met with comparative ease and with but a fraction of the cost of one of our great glass-lens telescopes. When we think of what has been accomplished by use of the Lick and Yerkes telescopes, whose lenses are 36 and 40 inches in diameter, respectively, we can set our imagination to work on what might be discovered by a perfect lens twenty feet across. So while the glass makers are working several years to perfect a lens for sky-pointing telescopes that cost hundreds of thousands of dollars, Professor Wood can construct a telescope many times larger for a hundredth of the sum, a telescope that may bring us into intimate touch with other planets. It is a bit staggering to surmise what might be seen in a revolving mercury surface twenty feet or more in diameter and free from vibrations. The one drawback in the mercury telescope is that it permits of no adjustment. It points only to the zenith, and if a star doesn’t happen to be on the zenith it does not appear in the whirling mercury. But this difficulty is not very serious. Owing to the low cost of mercury telescopes compared to the glass-lens ones, they can be built in different parts of the earth, Professor Wood says, and stars not observed in one may be seen in another. To bring Mars close a telescope would have to be put on the Equator, for Mars stands directly over the Equator. 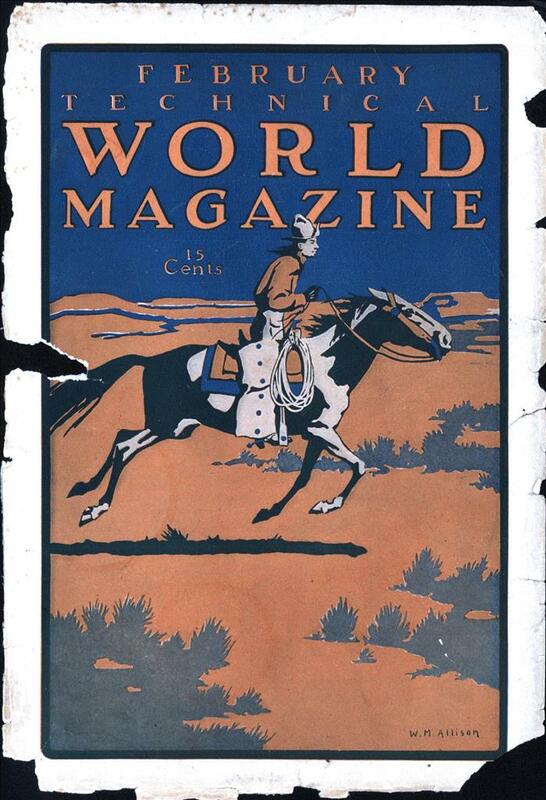 In the present year (1909) Mars will be closer the Earth than for many years. While Professor Wood says he isn’t searching for the Martians in particular, he would like to have the opportunity of putting a large mercury telescope on the Equator and observing the most written about planet in the whole solar system. While he hasn’t said much about his invention, news of it has come to scientific ears and it is attracting the attention of astronomers in several parts of the globe. When Professor Wood renews operations on Long Island this spring many eyes will be focused upon the results of his efforts to bring the universe closer together and the several planets around us into more friendly relations with us.